What's in your account when you first sign in. Steps for creating top-level calendars and sub-calendars. What sub-calendars are and when and how to use them. Dangers of, alternatives to, and steps for deleting. How to work with and organize calendars and publications. How to hide calendars, which ones you can hide, and more. Two ways to show the same event on more than one calendar. Use sharing permission levels to manage your workflow. Steps for sharing calendars and canceling sharing. Actions you can take with calendars shared with you. Track changes to calendars you share or that are shared with you. Manage events using shared calendars, hidden custom fields, and more. 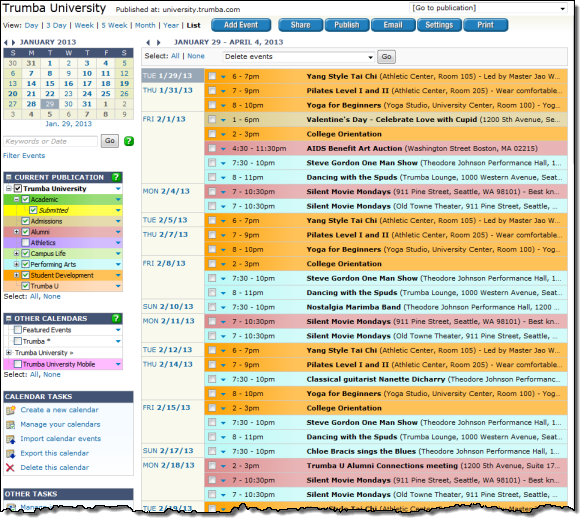 You can use several different methods to set up academic calendars in Trumba. Each calendar has an Images table where images you upload or link to are stored. How to print in black and white or color. Set and change account and calendar time zones. The principles that govern calendar and event time zones. Common time zone problems and how to fix them. You create and manage calendars in the Trumba® Connect editing environment. This flexible environment gives you numerous options for organizing and viewing calendars in ways that work best for the specific task you're trying to accomplish. The editing environment is also where you control calendar settings (from time zone to the templates available for entering events) and where you share calendars with other account holders. In this image, a top-level calendar called Trumba University is active. It's displayed in List view with a variety of colored sub-calendars mixed in.